February in the Pacific Northwest means it’s time to awaken. Get out of that dark cozy nest you’ve been hibernating in and stretch your wings just a bit. The sap is rising, daylight’s increasing, trees are pollinating and sleepy critters are stirring in the chilly wind. Spring starts now, you just have to look for it. Sometimes you have to look extra carefully, but there are signs. Me, I’m from Michigan. Spring starts in Michigan around, oh, late April if I remember rightly. So, I’m always amused and enlightened by how early spring starts here. We’ve had an incredible month of wild weather, haven’t we? And I don’t think the craziness will end just yet. I regularly check Cliff Mass’s blogspot for forecasts and an often entertaining interpretation of what’s happening, weatherwise. Not only was it freezing in February, but there was stormy weather on the home front this month. A special thanks to Paul Woodcock from the North Cascades Audubon Society for his help when I had to cancel the Wild Moon program on very short notice due to illness in my family. Paul is a wonderful and knowledgeable person to learn about birds from. I highly recommend birding the beach with Paul the first Saturday of every month at Semiahmoo Beach in Blaine. Beginners are welcome. 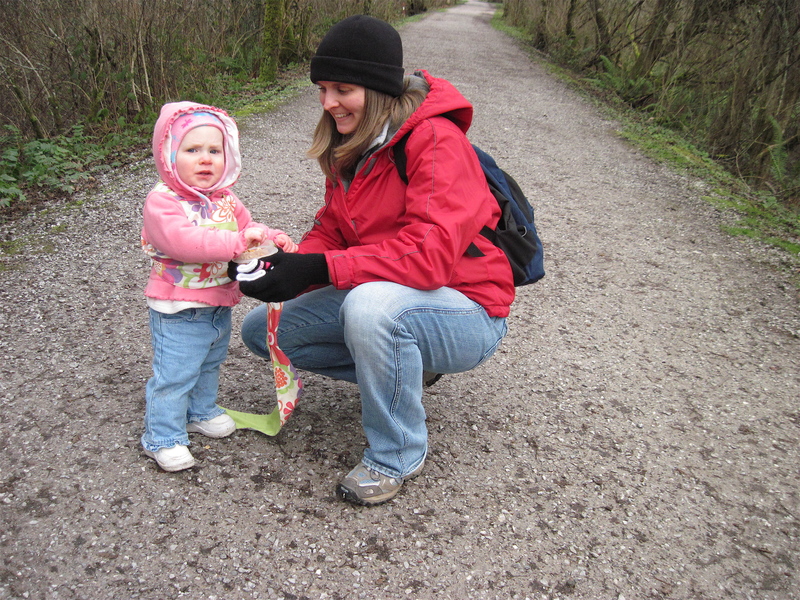 Nature Babies searched the Interurban trail high and low for spring this month and found some blooming! 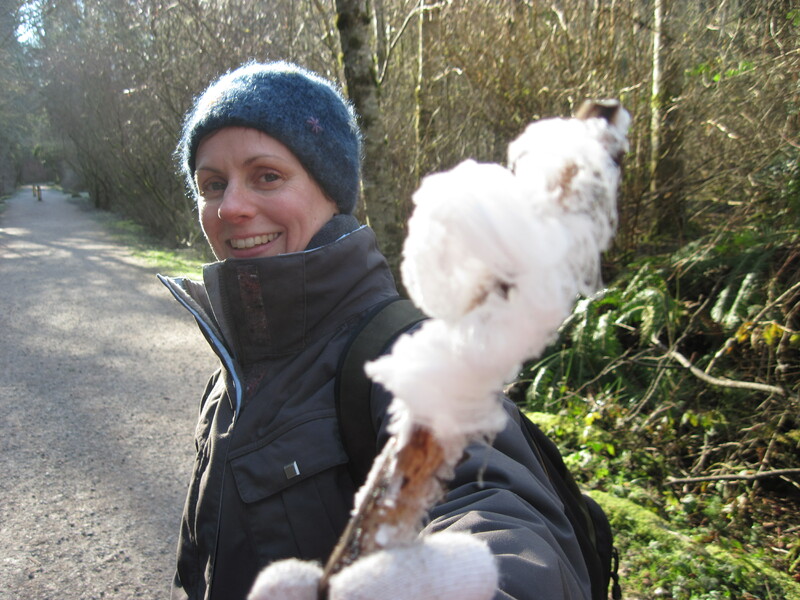 We found rare and beautiful frost flowers and then, real flowers! 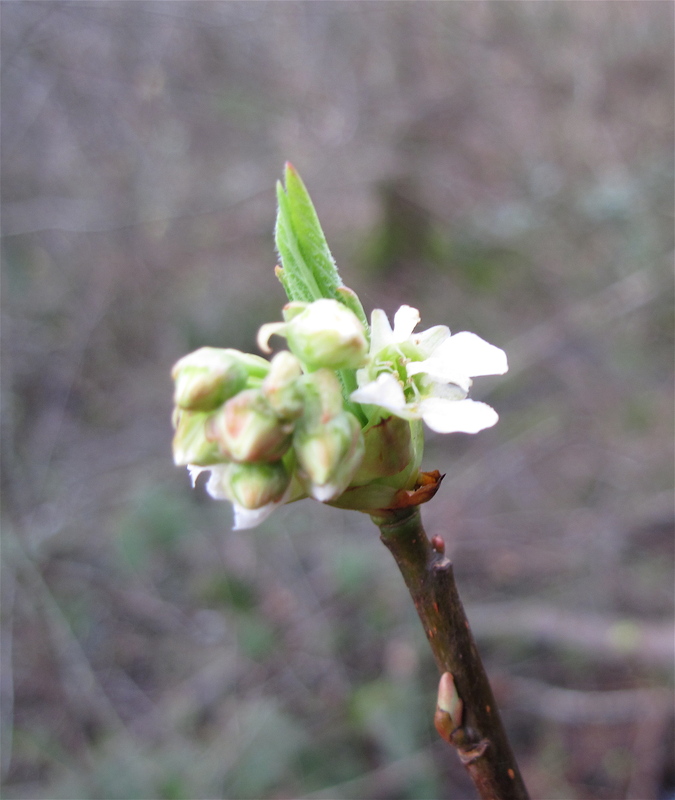 Indian Plum (Oemleria cerasiformis) is nearly always the first native plant to bloom in these parts, a sure sign of the season to come. Here’s the photographic evidence to prove it! The cascade of delicate white flowers are not big or showy, yet emit a distinctive scent. Some say the aroma is reminiscent of a strange mix of cucumbers and cat urine, others find it interesting and even pleasant. You decide. The shrub is common trailside in many local parks. Regardless of the way it smells, it makes me happy to see it blooming every February, even in a hailstorm! Golly, was it cold this month! How animals keep warm was a frequently discussed topic this month. 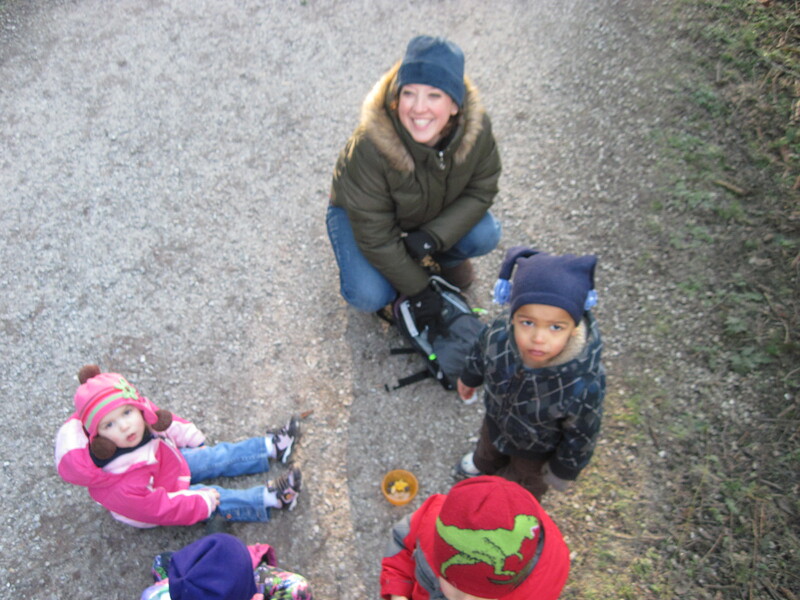 Here’s what the Nature Babies group came up with: Feathers, layers of blubber, thick fur, snuggling together in a nest (like snakes and squirrels), hibernating/torpor, flapping your wings, stamping your feet, eating a lot, wiggling your toes and moving quickly. 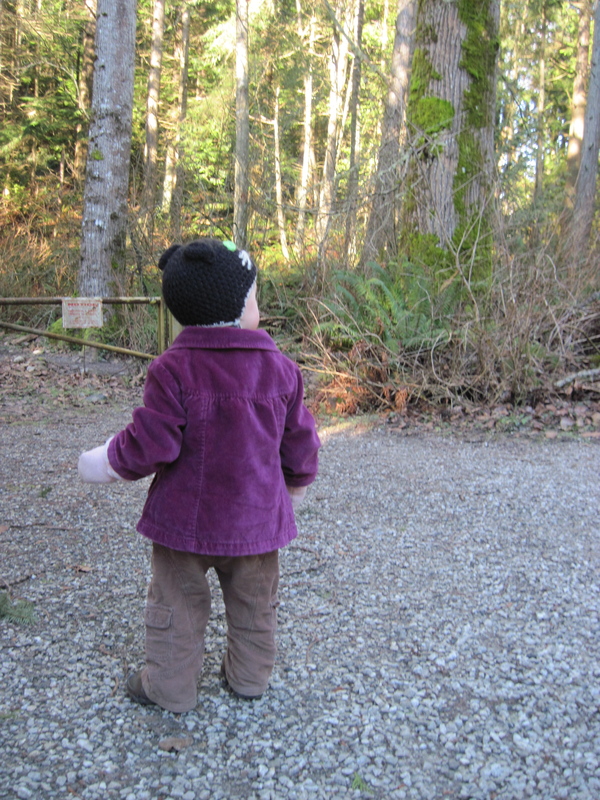 We counted squirrel homes, spied on their dining room and watched them bravely chase each other through a forest obstacle course. We looked at lichens with our home-made like-a-scopes (everything you see through them, you like). 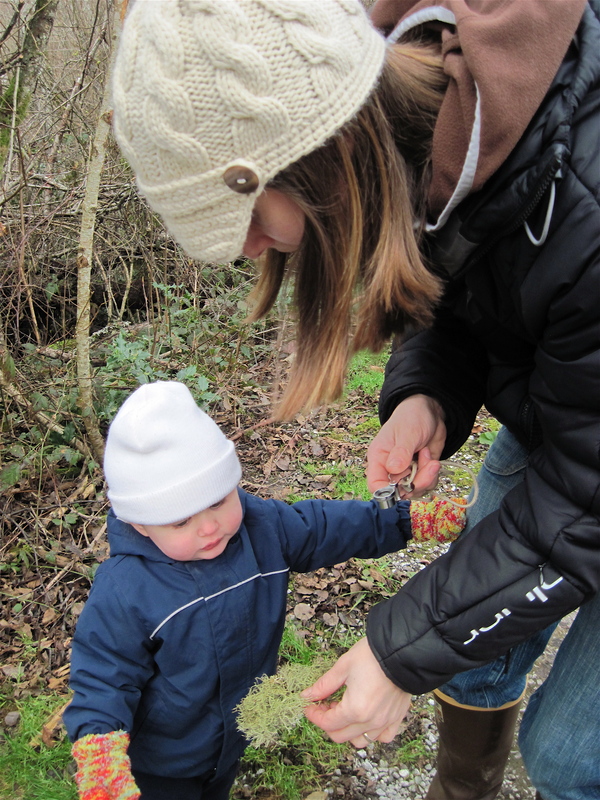 We encountered a truly wild Nature Baby (looking a little scared of our attention)! And on our last day, we explored in a legitimate hail storm. It was fun, really! You could hear it coming with a sharp tinkling sound, starting right at the tops of the trees until it reached us just moments later in a rush of hailstones that looked like snowballs for fairies. It was an awe inspiring and magical moment. 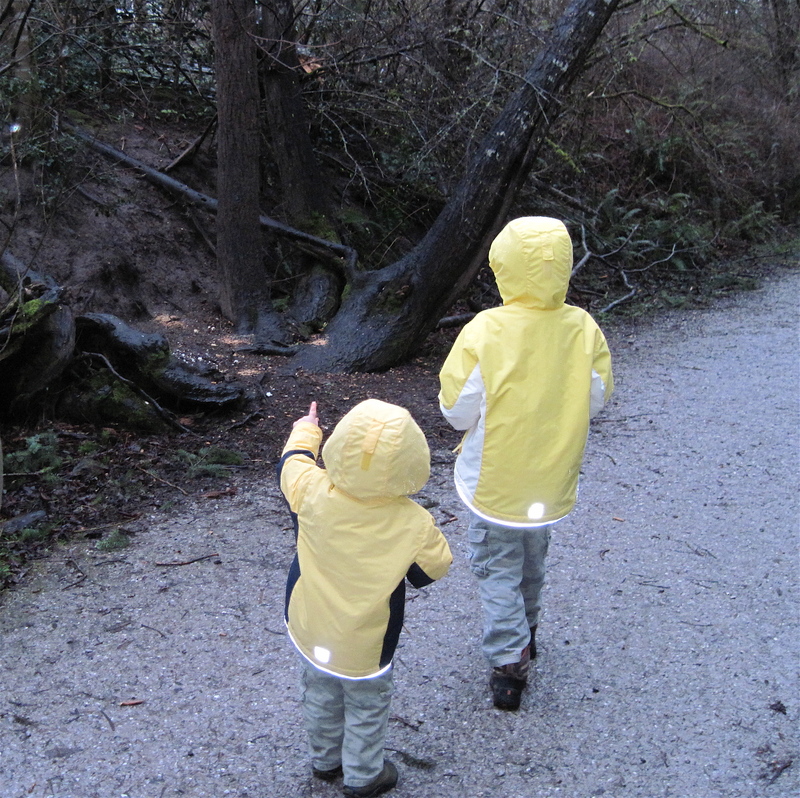 Then the hailstones went down the back of our necks. Brrr! 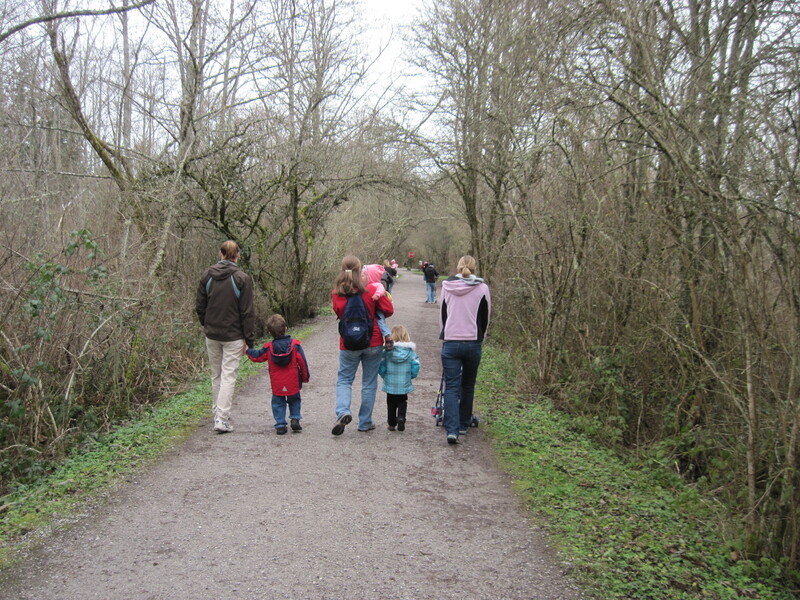 This program was co-sponsored by the Friends of Tennant Lake and Hovander Park, Brad Otto and Wild Whatcom Walks. 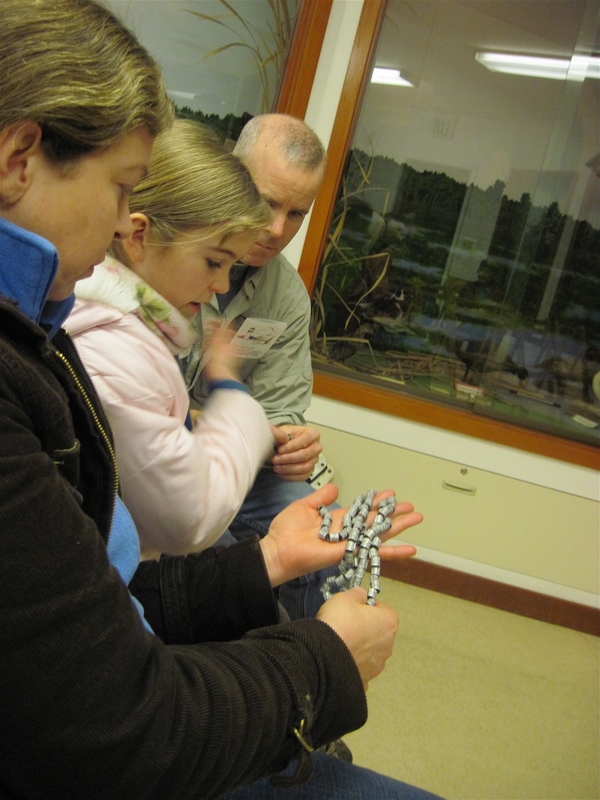 Brad Otto is a Science Technician for the Washington Dept of Fish and Wildlife. 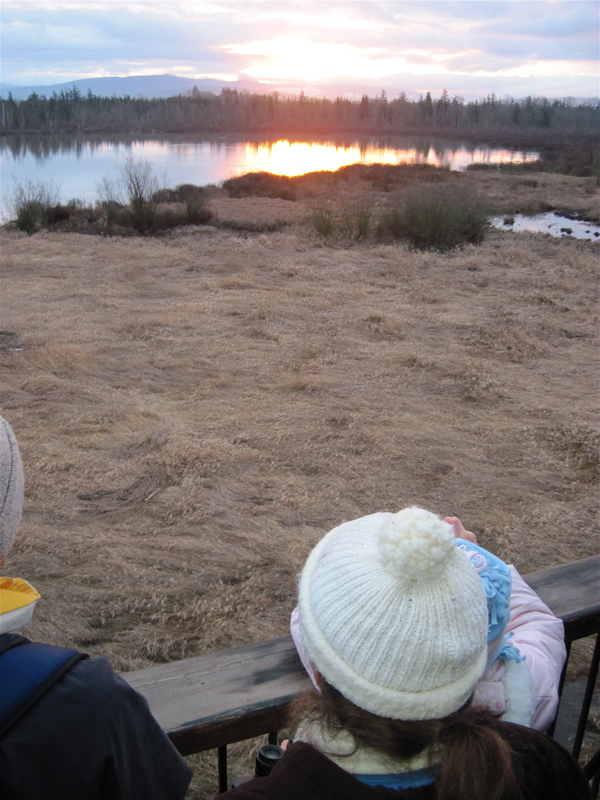 We gathered like early birds waiting to Trumpeter Swans take flight by first light. 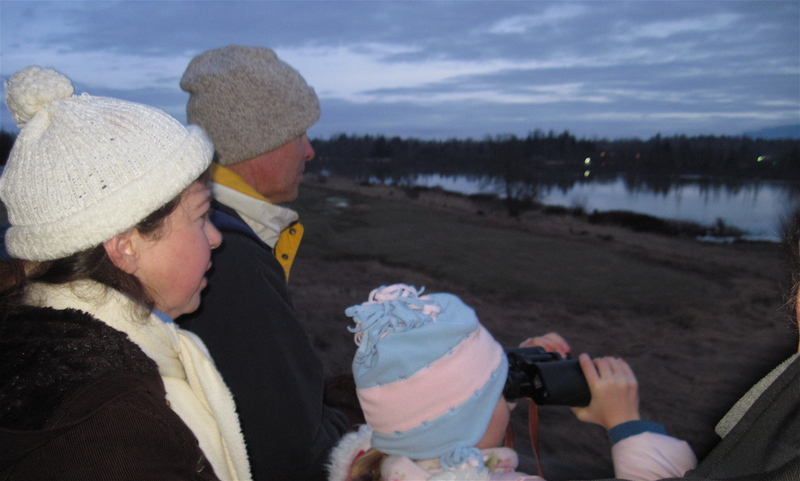 At 7 am we assembled in the top of the viewing tower of the Tennant Lake Interpretive Center to watch several groups of Trumpeter Swans slowly swimming on the lake. 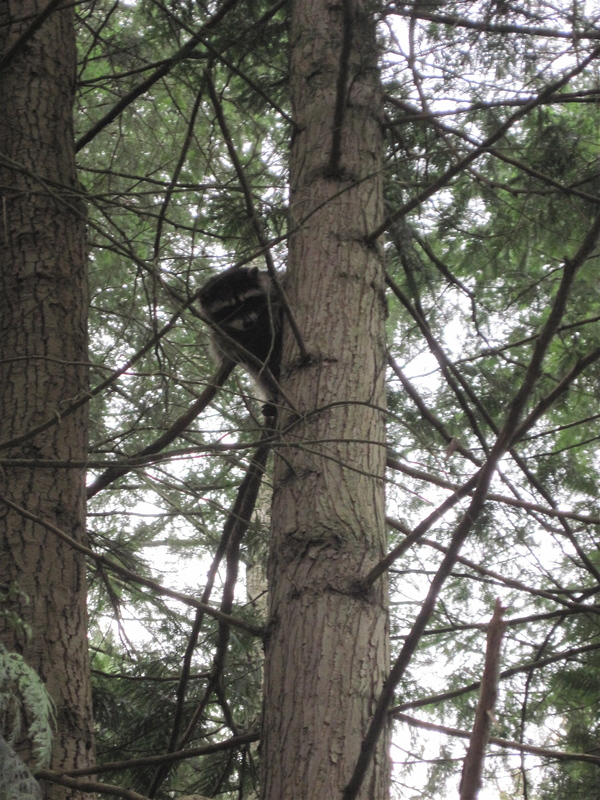 They spend the night there to roost in safety, surrounded by water to keep clear of predators. Seems like a good idea to me! Even though they are North America’s largest waterfowl and have a wingspan of 80 inches, they look like lunch to Bald Eagles and Coyotes. It was a lovely, partly cloudy morning and we were delighted to witness the swans fly off trumpeting after nearly an hour, just after the break of day. Truly lovely. Among Brad’s many tasks are banding and collecting data from Trumpeter Swans affected by lead poisoning due to old bird shot. That lawn ornament in the photo with Brad was called in by someone who saw a big white “swan” lying on it’s side, assumed it was dead, and called WDFW. Which is what you’re supposed to do! A dead swan that’s been poisoned by lead will be consumed by critters looking for an easy lunch like Bald Eagles, crows or coyotes and the lead poisoning will move on down the food chain, harming many animals on the way. Well, it was a legitimate sighting but not a real bird! 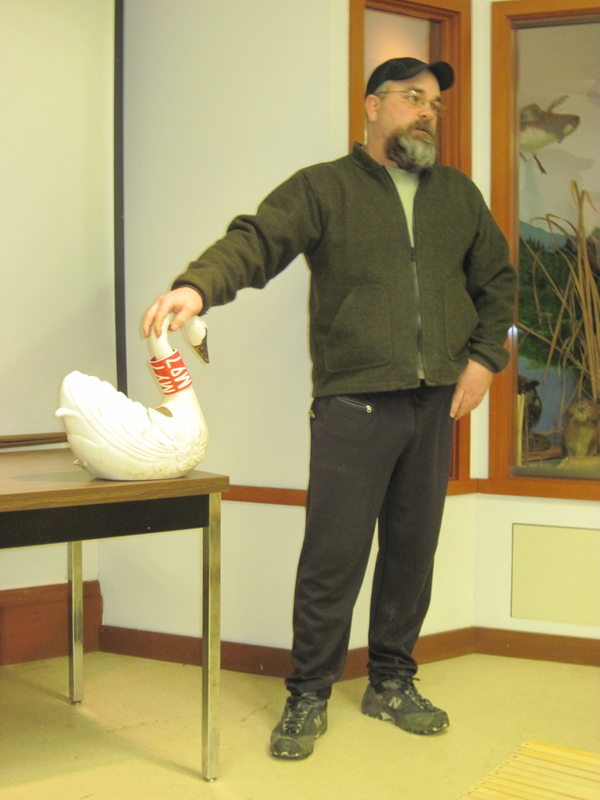 The originally orange beak of this pretend Mute Swan was colored black marker on the beak by Brad to be more Trumpeter Swan-like, and is now used to show how neck bands are um, incorrectly positioned. Brad shared a ton of information with us about the biology, distribution and work he does with Trumpeters. 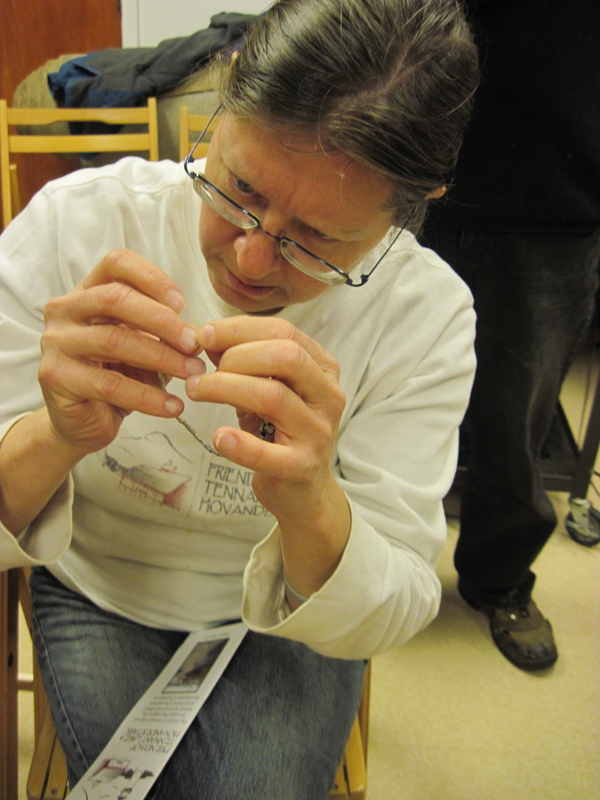 He showed us all the bands he uses to tag birds, every thing from tiny bands for passerines (perching songbirds) to the bands for Trumpeter Swans that would fit around your big toe. 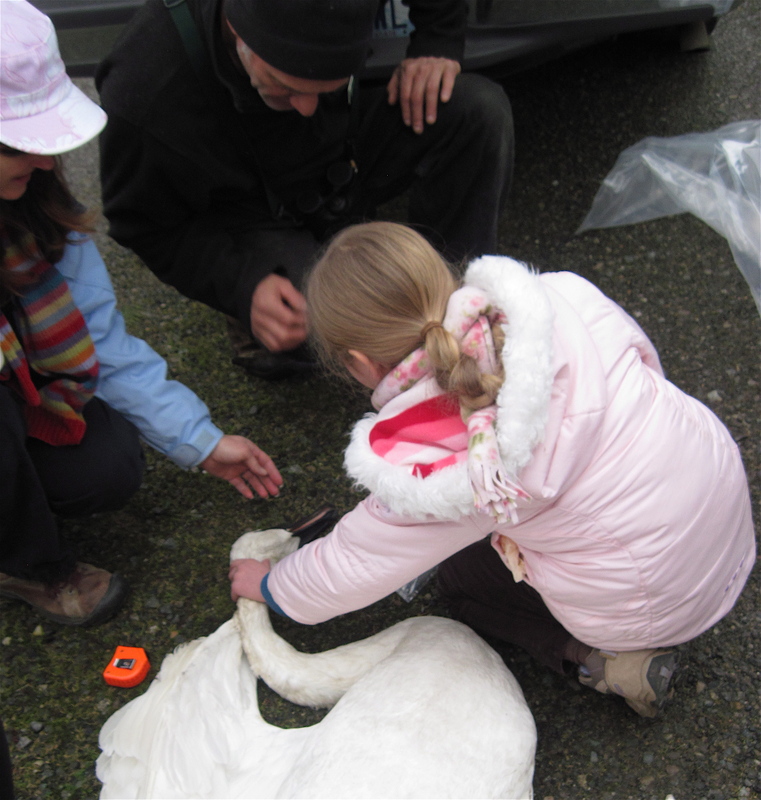 We had the opportunity to examine and touch a swan that died from suspected lead poisoning. 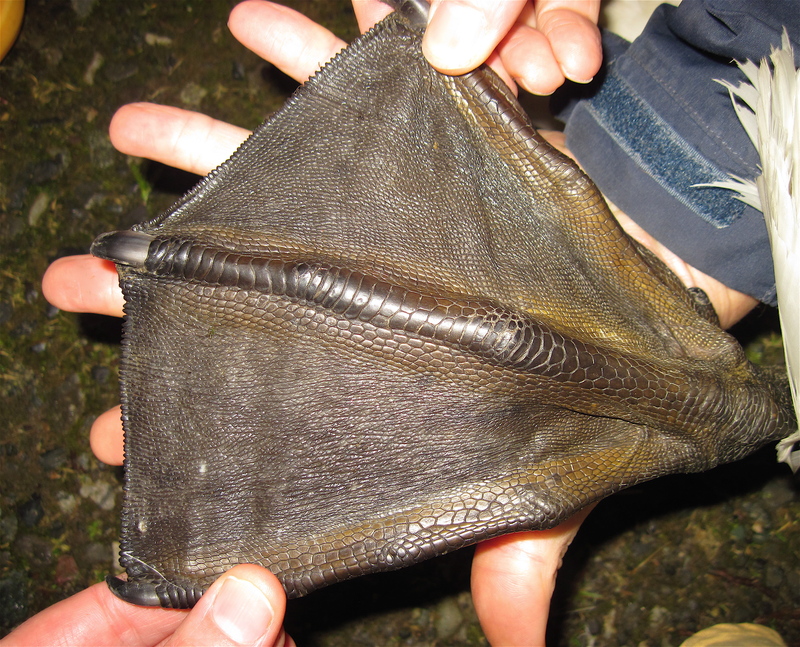 Check out those enormous webbed feet, aren’t they amazing? 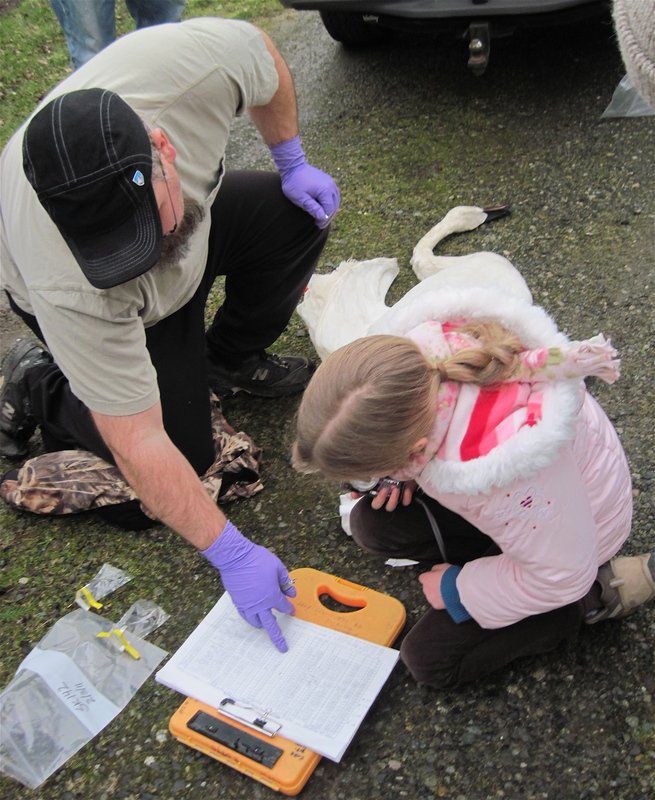 Future biologist, Heidi, helped with data collection as Brad dissected a small section of this swan’s liver for testing. This particular swan’s wings spanned over 90 inches from tip to tip! What an incredibly big beautiful bird. Thanks for the opportunity to see one of these incredible animals close up and personal, Brad! After the Swan Watch, Stephen Frank from the Friends and I waded our way around the Tennant Lake’s wonderful boardwalk (this is the last picture from my camera before I accidently dropped it in the water). Those beavers have been very busy this winter. Go check out their work, but wear your wellies! Will I see you on this trail? 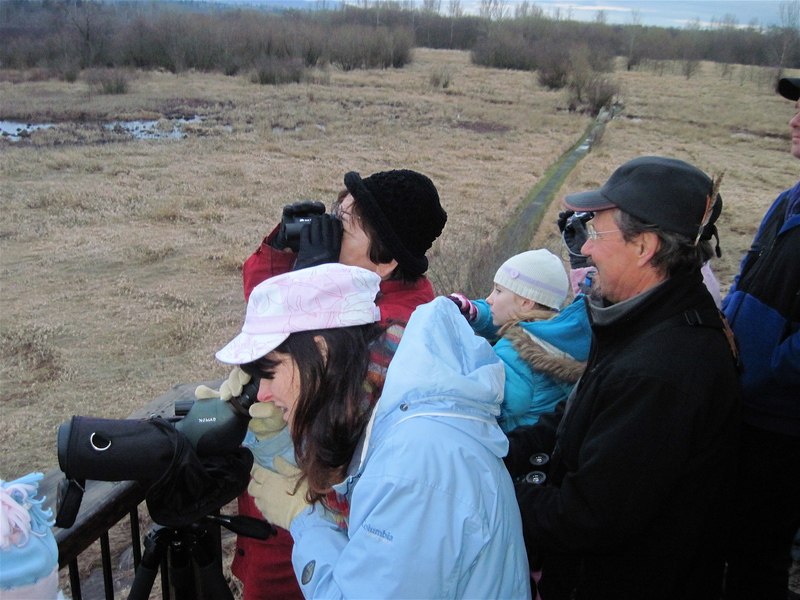 It’s one of my favorite places in Whatcom County for birding and wildlife watching. Go slow and stop often for good viewing. Oh no, is your camera OK? Love these pics & stories and look forward to joining in on your fun Holly. Especially fun that includes that sweet friend in the last photo!